NOTETo use the Morphing tool, see About Morphing. 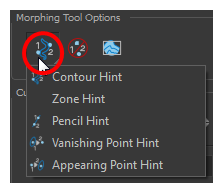 The Hint Type drop-down menu allows you to select the correct hint to remedy any problem areas in your drawing—see About Hint Types and About Morphing Hints. The Hide Hints button temporarily Temporarily hides the hint points from the key drawings. 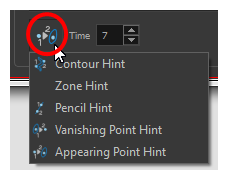 Use this option when you have a series of hint points hiding some lines you would like to see. The Show Morphing In Place option is used with morphing layers. 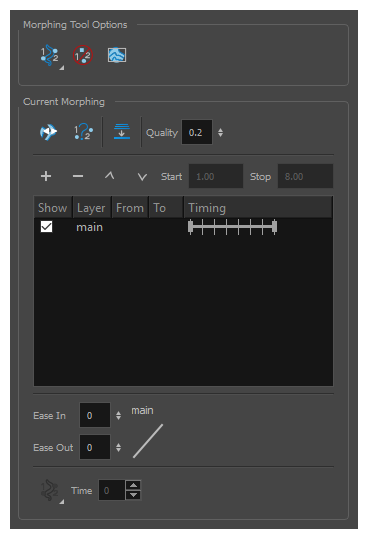 Enabling this option prevents the currently selected morphing layer from being shown on top of the others and maintains the correct layer ordering—see About Morphing Layers. 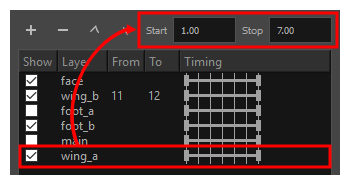 The Suggest Hints option is used to automatically set Automatically sets hint points on key drawings as a help tool. If you're not sure where to set hints, you can use this option. It will set the main hints which you can then fine tune. 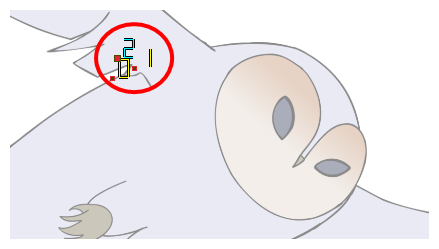 The Switch Between Drawings button is used to toggle Toggles between the two key drawings in your morphing sequence. This option is useful while setting hints. You can use the default keyboard shortcut F4 to toggle between your drawings. The Flatten option is used when you have to morph a sequence with a semi-transparent or transparent colour in it—see About Transparency Morphs. The Quality setting is used to make the lines of the morphed drawings smoother. Adjust this parameter when you are doing an extreme close up of your animation—see About Morphing Quality. The Morphing Layers option is used when working with morphing layers. You can add, remove and manage your different morphing layers in this space—see Creating Morphing with Morphing Layers. Add Layer Adds a new Morphing layer. Delete Layer Deletes the selected Morphing layer. Move Up Moves the new layer up in the stack. Move Down Moves the new lower up in the stack. Indicates the start frame of the selected Morphing layer. 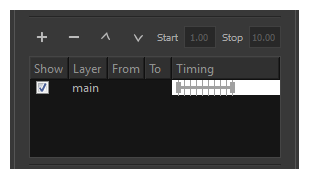 Stop Indicates the end frame of the selected Morphing layer. You can adjust the Ease In and Ease Out value by dragging your cursor up and down or typing a new value. The values go from -1.0 to 1.0—see About Morphing Velocity and Timing.